Home to a myriad of unique destinations, Vietnam offers a wide range of options for tourists and adventure lovers. In the space of two weeks, this tour plunges you into the heart of the country and takes you on an exhilarating journey through some of its best scenes and activities, leaving you with a scintillating and memorable experience. You will visit Ha Long Bay, with its emerald rivers, abundant lakes, beaches and many limestone islands topped by thick jungle vegetations. Home to a host of plant and animal species, Ha Long Bay is a wondrous structure of rocky formations and enormous caves. You will also discover the famous cultural and historical relic that is the Cham Towers, an ancient temple used as a place of worship by Cham, Chinese and Vietnamese people. You will encounter the beautiful mountainous town of Sapa, home of the Fansipian Mountain and numerous ethnic minorities including the Cat Cat village people. The tour also takes you through Central Vietnam to the City of Hue, which served as the capital city for about 150 years during the Nguyen Dynasty, brimming with royal lifestyle and customs and attracting tourists with it’s Imperial city, vast citadel and Forbidden Purple City. The city was the battleground for one of the longest and bloodiest battles of the Vietnam War. In the historical French colonial port of Da Nang City in Central Vietnam, the tour will take you through its many sandy beaches, temples, Cham Museum and Marble Mountains. The tour ends in the southern city of Ho Chi Minh, referred to as Saigon. This is the most populous city and the financial centre of Vietnam and is reknown for its pivotal role in the Vietnam War. It has an immense French influence, evidenced by the abundance of historic French colonial buildings and houses a number of landmarks and historical edifices. This 14-day tour immerses you into the Vietnamese culture and lifestyle, intimating you with the local life, vast underground tunnels, produce markets, cafés, and bustling, floating markets, among others. It features walks, car and boat rides, train trips and short flights. You will be conveyed from the Airport to your hotel. The Vietnam Experience begins in the afternoon when you will be given a private tour of the Old Quarter and Hanoi local markets. You will walk through some of the 36 streets of the Old Quarter, providing you with a glimpse into the life of the residents. Later in the evening, you will enjoy an entertaining water puppet performance after which you will have dinner at a local restaurant. After this brief introduction to the Vietnam culture on the first day, you will stay overnight in Hanoi. There will be a full-day tour of the illustrious capital city of HanoI. The tour takes you through the ancient architectural designs of the city, its street-lined stalls and vendors, temples and some of its more captivating scenes such as the Presidential Palace, the One Pillar Pagoda and the Ho Chi Minh complex. You will board an overnight train afterwards to convey you to the border city of Lao Cai on your way to Sapa. The train reaches Lao Cai in the early morning and you’ll be transported by a waiting vehicle to Sapa, this takes about 1hr 30 minutes. You will be dropped at your hotel in Sapa, where you’ll lodge and have breakfast in the hotel restaurant. You get the morning free to explore and take in the environment, and take a walk to Cat Cat village, home of the H’mong people. 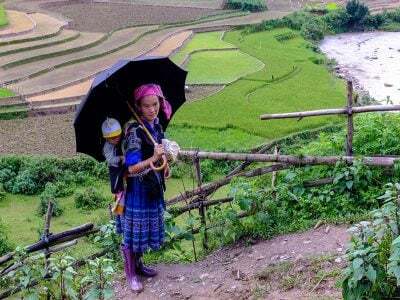 You will explore the other hill tribe villages in the valley beneath Sapa, encounter the locals and experience their cultural and religious activities and lifestyle. You will spend the night in Sapa after the activities of the day. You will experience the Sapa Sunday Market in the morning after breakfast and then head on a trek through villages of Lao Chai and Ta Van. The hill tribe people resident to this area are some of the most amiable people you will encounter. The walk takes you through buffalo paths against a backdrop of the unique, beautiful and untamed scenery. You will have a picnic lunch stop along the way and then be transported to Lao Cai to board the overnight train back to the capital city of Hanoi. After a night of refreshing sleep to the gentle rocking of the emerald waters of the Bay, you may take a quick swim in the morning and settle for breakfast while taking in the majestic sights of the Bay. You will then explore the Sung Sot cave and the Soi Sim Beach for a combined 1hr 30 minutes before taking a cruise back to the pier, having brunch on board. From the Ha Long Harbour, you will take a drive to Hanoi Airport to board a short flight to Hue. On arrival, you will be conveyed to your hotel where you will rest for the night. Hue is the commercial and educational centre of Central Vietnam, it is topped with numerous pagodas and caves of Buddhist shrines. You will take a tour of the City, exploring its many attractions, including the Dong Ba market, the Forbidden Purple City and the Imperial city and museum which are enclosed within the Citadel. You will spend the night in Hue. After breakfast at the hotel, you will take a boat ride to the Perfume River, which derived its name from the perfume-like aroma of the flowers which fall into the river during Autumn. You will discover the majestic architecture of the Minh Mang royal tomb, the Pagoda of the Celestial lady(also know as the Lady Pagoda), a 7-story iconic Pagoda that is regarded as the unofficial symbol of Hue city. 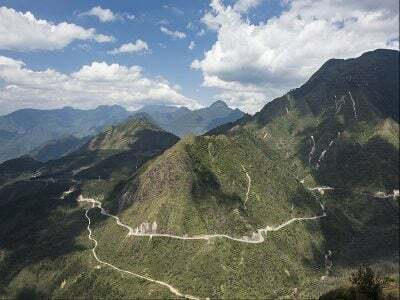 After lunch at a local restaurant, you will journey over the Hai Van pass on your way to Hoi An, stopping at DaNang City to visit the Cham Museum and Marble Mountains. At Hoi An, you will be checked into your hotel and enjoy some free time for personal exploration before settling for the night. Formerly known as Fai-Fo, the city of Hoi An is in the Quang Nam district. It is a longtime trading port city with diverse architectural designs, showcasing buildings which display a blend of local and foreign influence. You will have a half-day walking tour of the City, exploring the Tam My ancestral house (a beautiful, private house built two centuries ago and preserved through seven generations), the Chinese assembly halls, the Chua Ong pagoda and the sinuous streets of the Ancient Quarter. You will have free time after the tour to relax or shop for souvenirs after which you will retire for the day, sleeping overnight in Hoi An. You will board a flight from DaNang Airport to Ho Chi Minh City. The flight lasts for about 1hr. Later at noon, you will take a city-wide tour of Ho Chi Minh, enjoying the picturesque views offered by the most populous Vietnam city. You will discover popular sights like the Reunification Palace, the 19th century Central Post office, the municipal theatre and the Notre Dame Cathedral which was built from materials imported from France. The streets are lined with a wide array of food stalls, especially around the busy Ben Thanh market. You will spend the night in the ancient city of Ho Chi Minh. You will take a drive to the Cao Dai Tempes of Tay Ninh, a place of worship of Caodaists created in honor of Cao Dai, their supreme deity and creator. You will be able to observe the midday service of the Cao Dai followers, who worship Jesus Christ, Confucius, Taoism and Buddha. You will be conveyed to My Tho in the Mekong Delta area of South Vietnam. Home to the first railway route in Vietnam, My Tho is popular for its My Tho River and its floating markets. You will enjoy a private cruise on a boat to an orchard where you will enjoy lunch and tropical fruits at a local restaurant. You will discover the Dong Tam snake farm, where snakes are bred for snake wine and also visit the VinhTrang pagoda. You will stay overnight in the heart of Mekong Delta, in the city of Can Tho. Today, you will explore the floating market of Cai Rang, one of the busiest in the Mekong Delta. The floating market features numerous tiny boats of merchants bargaining and selling their respective goods. After observing the market and sampling some tropical fruits, you will be conveyed back to your hotel by way of interconnected canals. Lunch will be at a local restaurant and you will spend the night in Ho Chi Minh City. An alternative to this arrangement includes the Lady Hau cruise which is an early morning cruise for early risers. It features a cruise to the floating market, with breakfast aboard the Lady Hau. You will then be transferred to a local boat at the Cai Rang Market. This takes you through the bustling floating market, creeks, a noodle factory and an orchard. You will enjoy local tropical fruits and then return to the hotel through a system of canals. The final day of the tour is a free day that affords you the opportunity to do some personal exploration and souvenir-shopping. 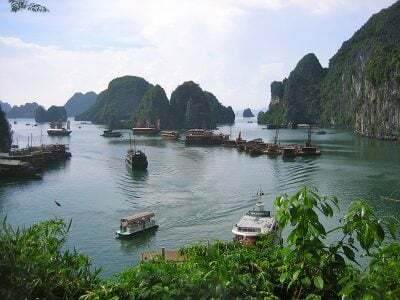 Afterwards, you will be transported to the airport for your departure flight, thus concluding this 14-day grand adventure of the best of Vietnam.